The CompRT 6-3/4-Inch Subwoofer is an all-weather thin sub with a pair of 1 Ohm voice coils. A tough exterior is just the start of this slim mount subwoofer. With a mounting depth under three inches and plenty of power handling, this go-anywhere sub is as flexible as it is powerful. The CompRT 6-3/4-Inch Subwoofer works best with a sealed enclosure and 150 watts of recommended power. The only thing thin about the CompRT Subwoofer is the mounting depth. Whether it's on the road, sand or trail, these tough subs work perfectly in nearly anything with a motor. The CompRT 6-3/4-Inch Subwoofer is an all-weather thin sub with a pair of 1 Ohm voice coils. A tough exterior is just the start of this slim mount subwoofer. With a mounting depth under three inches and plenty of power handling, this go-anywhere sub is as flexible as it is powerful. 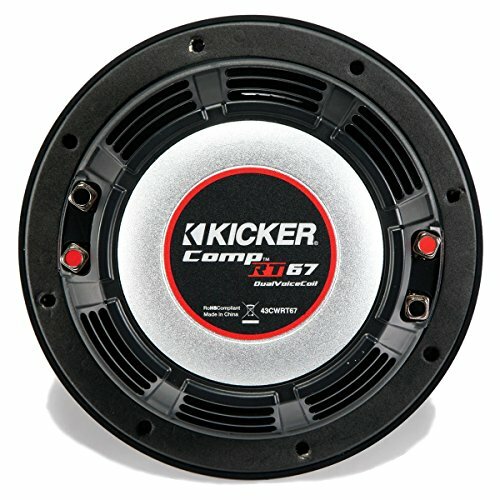 The CompRT 6-3/4-Inch Subwoofer works best with a sealed enclosure and 150 watts of recommended power.